Experience the thrill of zip-lining through gorgeous, untouched rainforest terrain on the hidden away Wingfield Estate. Lush vegetation, beautiful flowers, mango trees and mischievous moneys await in this lively, tropical paradise. While you’re visiting, learn about the traditional art of batik at on-site cultural centre Caribelle Batik, and explore the history of a former sugar plantation with a tour around the findings of archeological digs in the grounds. Learn about the food of St Kitts and the Caribbean with a cooking class at the Nirvana Restaurant in the grounds of former plantation mansion Fairview House. After a tour around the mansion’s well-preserved and fascinating rooms, which include period antiques and accessories, head to the bright public kitchen for a cooking demonstration with a professional chef. Sample the tastes of the island by indulging in the food that’s just been created. Laid-back vibes, reggae tunes and cocktails on the beach; Cockleshell Bay is a great spot to put your feet up and sun yourself for a few hours. More adventurous types can take advantage of the plethora of water sports and other water activities on offer, including the chance to sail over to neighbouring Nevis on a four-person catamaran boat with a qualified sailing instructor. El Fredo’s: Enjoy relaxed, rustic fare in this family-run restaurant. Great for fast service, delicious food and reasonably-priced rum cocktails. Be sure to try the shrimp. Fisherman’s Wharf: Mouthwatering seafood dishes in a stylish modern restaurant overlooking the ocean. Their desserts range is both absolutely divine. Spice Mill: Flavoursome and formidable, indulge in tapas and full meals at this modern beachfront restaurant. Start your meal off with an indulgent selection of tapas dishes. The St. Kitts Marriott Resort & The Royal Beach Casino is a beachfront hotel featuring the Caribbean’s largest Vegas-style casino, a variety of dining options, a spa and a championship 18-hole golf course. Rates currently start at $223 per night and fluctuate based on season. British Airways fly from London Gatwick to St Kitts twice per week with a short stopover in Antigua. American Airlines (via Miami daily and via New York several times per week) and Air Canada (via Toronto on Mondays) also offer flights from London Heathrow to St Kitts. All photos included above were taken by Jesse Norton and are licensed under a Creative Commons Attribution 4.0 International License. Posted on October 12, 2014 by Lauren. 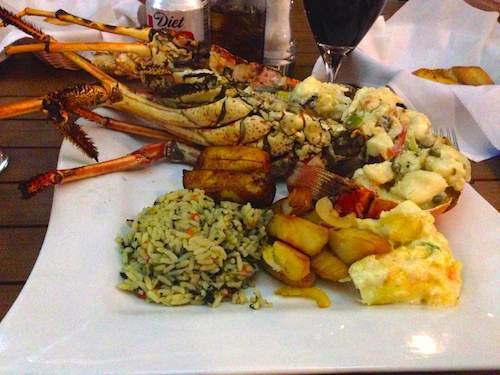 This entry was posted in Travel and tagged Caribbean, Food, St Kitts, Travel. Bookmark the permalink.